Zimride is a private ridesharing network for Carlyle Council. Carlyle Council has partnered with Zimride by Enterprise to help the employees of our Carlyle Council member commercial properties share rides with one another to help alleviate traffic related stress, save on parking and gasoline expenses and foster a sense of community -- all while working to reduce our carbon footprint. Let Zimride help take the stress out of your commute! Are you tired of the stress and hassle of your daily commute? Carlyle Council has partnered with Commute With Enterprise to offer all employees of Carlyle Council members a cost effective option for getting to work. For more information or to join a current vanpool, log in and visit the Carlyle Council Zimride Vanpool page or contact Dayna Paszkiet with Enterprise. GRH provides commuters who regularly carpool, vanpool, bike, walk or take transit to work with a FREE and reliable ride home when one of life's unexpected emergencies arise such as a personal illness, sick child or unscheduled overtime. Knowing there's a guaranteed ride home allows one to use these commuting options with peace of mind and confidence. Best of all, the GRH service is FREE! To join sign up here. Questions? Call 1-800-745-RIDE. Carlyle Council administers a Transportation Management Program (TMP) in coordination with the City of Alexandria to encourage commuters to use alternate modes of transportation to get to work. 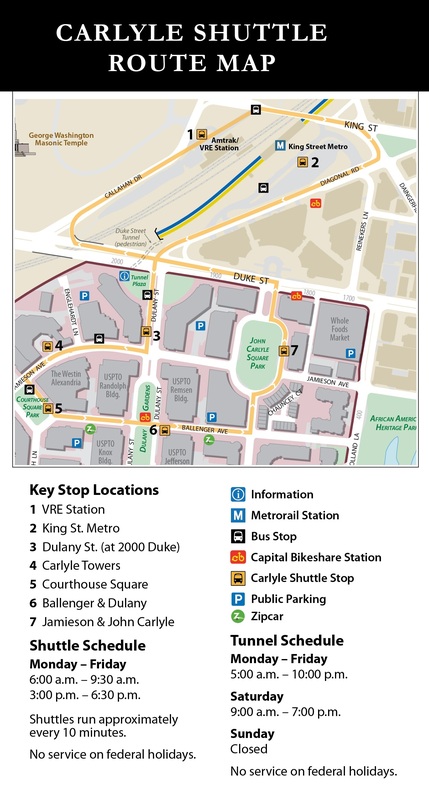 The Zimride ridesharing service is a new program offered by the Carlyle TMP, adding another option to its programs including a rush hour shuttle service, discounted Capital Bikeshare memberships, Carlyle maps, pedestrian tunnel access to King St. metro station and discounted SmarTrip cards. Zimride is only available to Carlyle Council member properties and requires a valid business email address to join. For a complete list of approved email domains Click Here. If your employer or work email address isn't listed please contact your HR representative to receive a one-time invitation link to join Zimride. Zimride is one way that the Carlyle Council is committed to optimizing your transit options.Visit the Carlyle Council website and Facebook page for all the latest updates. You will be receiving emails from Zimride to notify you about ride matches. After you create your profile, be sure to place notification@zimride.com into your approved email list to avoid your spam email box. If you telecommute several days during the week and have a varied schedule of when you need to go into the office, you can still use Zimride to find and post a ride. Use the One-Time trip option to post a ride for a particular day and share the ride with others going the same way.